Over the past decade, the Wealthy Nation West (WNW) suffered under the heavy load of conscience-grubbing photos by Pieter Hugo combined with "fun anti-facts" by Basel Action Network and Greenpeace. The bright regulators in Europe and PACE, Interpol, StEP and Secretariat of the Basel Convention were busy at work, designing tests and enforcement procedures to protect African consumers from the wicked or accidental fallout from Africa Tech Sector Importers like Joe "Hurricane" Benson. The tests were difficult, a thankless task for scores of customs agents who struggled to program their VCR machines in the 90s, and who probably paid for Windows 8 upgrades and have 2 smartphones and 3 flip phones in their dresser. The diagrams drawn by Europeans showed used PCs heading down a pipeline of decisions, like a stool down a chamber of drains. The generator was the "actor", a fetish of guilt and liability attached to the used electronic "waste" device. WNW could have saved a lot of money on sewers if Africans were at all motivated to come to America and Europe and pay to ship our feces and urine to unregulated rivers. But of course, why would an African do that? Interpol, UNEP, and others repeated ad nauseum the fake fact that TVs and monitors had lots of gold and were worth lots of money when banged apart by kids with hammers. That millions of dollars were spent, and Hurricane Joe Benson imprisoned, based on the malarky that avoided disposal cost was an ATM for Africans is shocking because anyone who spent 15 minutes taking apart a display device and weighing the copper on a bathroom scale could tell you it was nonsense. They counted the number of TVs in Joe Benson's containers, but they never employed the math to show that the value of the copper never paid for the shipment of the container, only the reuse did. But far be it from Europe to take economics and African judgement into consideration. The used electronics resembled waste, and anything downstream from Europe was to be mopped up. As it turns out, "it's not about you". The report from Fair Trade Recycling's visit to Agbogbloshie, Ghana, is nearing completion (60 pages). Final draft abstract below. "There is no evidence that Europe’s WEEE testing measures reduce the spoilage or benefit Africa, or that they are based on knowledge of supply and demand in the African market. Evidence supported some Africans’ speculations that those profiling Agbogbloshie as a significant story (reporters, policy makers, anti-gray-market manufacturers, shredding companies, metals recyclers, environmentalists, photojournalists) personally benefit from false or exaggerated portrayals. The report recommends incorporating Africa’s Tech Sector in managing Africa’s growing scrap generation, rather than impugning it. The burden of proof on allegations of shipping junk should be born by the accusers who benefit from the reduction in trade." By taking extra months to finish the report, I could find more secondary resources outside the "waste" world - e.g. Odaw River sample data from the 1980s, rate of TV imports in the 80s and 90s, urban development reports, World Bank Data, etc. This will be the worst single embarrassment to our environmentalist community if we don't get out in front of it, apologize for our implicit racism in profiling Africa's Tech Sector, and call off the dogs. I'm serious, people. I don't want this to come out in Rush radio. We need to deal with this and stop this McCarthy tactics by certain ENGOs. We were not immune from implicit racial profiling, and we need to show the guts to admit it and get in front of this story now. FREE JOE "HURRICANE" BENSON. Sign the petition to the top right of this blog. Before you assume an old computer that you expected at your waste shredder was purchased and shippped by Africans as junk, look in this pile. Until we count them here, the "export percentage numbers" are just speculation. Who's the Troll: But how much are Fair Trade Recycling staff Paid? See April 2012 Post "Useless Lists of Jobs Beneath Wealthy People"
I confess I've lost interest in the "rate of pay" issue in voluntary trade. What drives participation in low-pay or exploitative or criminal activity is generally a lack of other opportunities. A system where USA or EU "moral agents" are expected to give their imprimatur to each potential activity, when the EU-USA agents of conscience don't know the context of the choice between opportunities, can ironically limit opportunities. The agent of conscience too often plays an unwitting role (or bears responsibility) when labor finds its own level, in the vacuum created by limits on trade opportunities. Not buying a recycled product, or not supplying a recycled feedstock, unless you know how much the maker is paid, is usually a terrible idea. The more consumers buy (demand) the product, the more opportunities the "marginalized" workers will have. If in doubt, let the affected worker of your concern choose their opportunity. The "agent of conscience" in the west is initially fed a righteousness-rush. That's a little jolt of ethical dopamine, for having made a righteous purchase (see also "moral licensing"). The purchase may simply mean "cash" to the "marginalized" producer, e.g. the African women in the business of washing scrap plastic bags to make tapestry, rugs, and purses... they often don't "get" the moral angst angle. Learn more by reading about "spiritual materialism" (Trungpa) or Steven Pinker if your goal is to know thyself. Here is film of Africans taking used film plastic, like trash bags, washing them and using them in weaving (replacing cotton). I posted it and someone immediately asked me how much the people were paid. The result of multiple studies by US Trade Commission, Secretariat of the Basel Convention, Memorial University, MIT, etc. is damning. Second Hand electronics, imported to Africa, are not a "digital dump" or "reuse excuse" or "sham recycling". African Techs know more about what works in Africa than the NGOs do. "E-Waste" filmed by photojournalists like Kevin McElvaney and BitRot did originate in Europe and the USA, but those filmed were imported by Africa's Tech Sector 20 years ago. The device being scrapped by a metal worker in a slum has lived a long and healthy second life, bringing affordable internet and teledensity to the continent for two decades. Interpol's "Project Eden" is about 6,000 years too late. An NGO took the pics of kids at dumps and said "We must arrest the exporters". The exporters, according to Interpol, are mostly Africans like Joe Benson. And stupidly, Lord Chris Smith listened to fictious, made up statistics of 80% dumping, repeated by the photojournalists, a statistic with no economic reason to it and now without a source. No source. None at all. Because the NGO source of the dumping data claims never to have said it. Since there's no source for the Story of Stuff, it is time to listen to Africans, like Grace Akese, Emmanuel Eric Nyalete, Wahab Muhammed Odoi, and others in Africa's Tech Sector who explain how the old VCR being hammered for metal at Agbogbloshie was imported in the early 1990s. Most TVs sold in Africa in the 80s and 90s relied on VCRs for programming. Now there is satellite, there are 21 Ghana TV stations broadcasting, and streaming internet video carries the programming. So the VCRs are being junked. Just like here. I've got 2 working ones here in my house that I haven't used for 5 years. 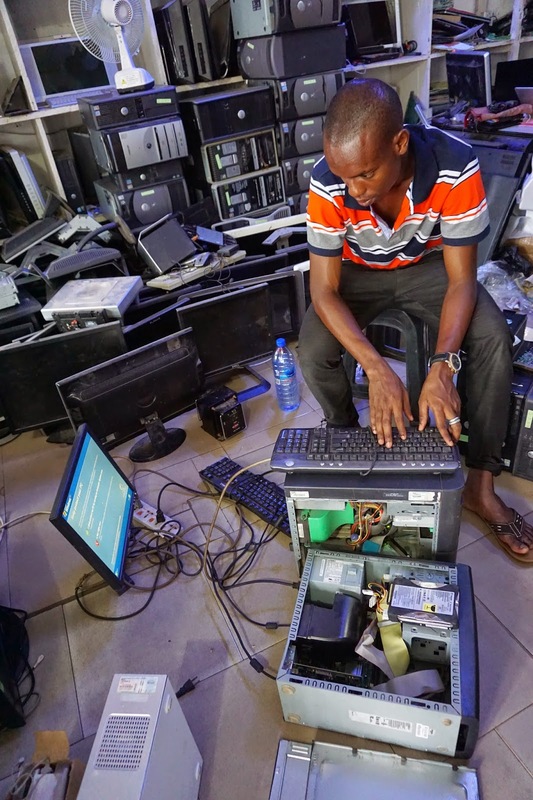 "Where does the WEEE / E-Waste photographed in Africa come from? Wasn't it obviously imported?" Sure, anything not manufactured in Africa was imported, and Africa has even less electronics manufacturing than the USA does. But beware the "car waste" fallacy. Junk Volkswagens at a dealership show trade-ins, after decades of use, not "illegal German a-waste dumping". Retailers we interviewed in Ghana sell mostly used Western electronics. They often do repairs, not just on what they import, like a car dealership that has a repair shop (most USA dealerships). With these interviews in the background, here is a list of 5 Sources of E-Scrap at Agbogbloshie. Exhausted product. For example, TVs imported to Ghana in 1970s, 80s,, 90s that are no longer worth repair. Elective upgrade. For example working VCRs which people choose to replace with DVDs, due to affluence and declining costs of newer technology (DVD players). Home Breakage. Product damaged by electric surges (see reports on Ghana electric grid problems. This is more likely to be brand new product, lighter circuits which can't resist power surges. It explains why Ghana consumers prefer "solid state" 1990s products. Fallout of recent imports (est. 9% of new and used imports). "Fallout" is called "breakage and spoilage" in tracking commerce. A percentage of rice, of cars, of books, etc. always finds damage in shipping or human error. This includes working goods which sit on the shelf too long and don't sell (and are not re-ordered). Working Refrigerators, Air Conditioners, etc. New electric standards in place in Ghana are designed for energy conservation. Older white goods are seized by Ghana customs (working ones which are eligible for subsidy to reduce electric grid demand). Yes. There is scrap being recycled in ugly ways (See 2012: Ten Most Toxic Africa E-waste Recycling Practices). But the sources of that scrap are not what photojournalists claimed. Number 1 is blatantly obvious to anyone who lived in Ghana in the 1980s and 1990s. Ghana has 21 Television stations. Most households in cities like greater Accra (4M residents) have had electrical appliances, computers, TVs, cell phones, radios, VCRs, etc. for decades. Ghana is generating far more "ewaste" than we can see in Agbogbloshie (which is mostly car and appliance scrap metal). African consumers, like Americans, tend to believe a 1970s television (which they purchased in the 1980s) is more valuable than it is. No one in Africa wants to buy a VCR, but the consumer remembers how much it costs. USA car dealers have these discussions all the time... consumers believe their 1980s Volkswagen is worth more than the dealer does. Number 2 is the devil wrestled with by retailers. They must place orders now for something consumers will buy 3 months later. 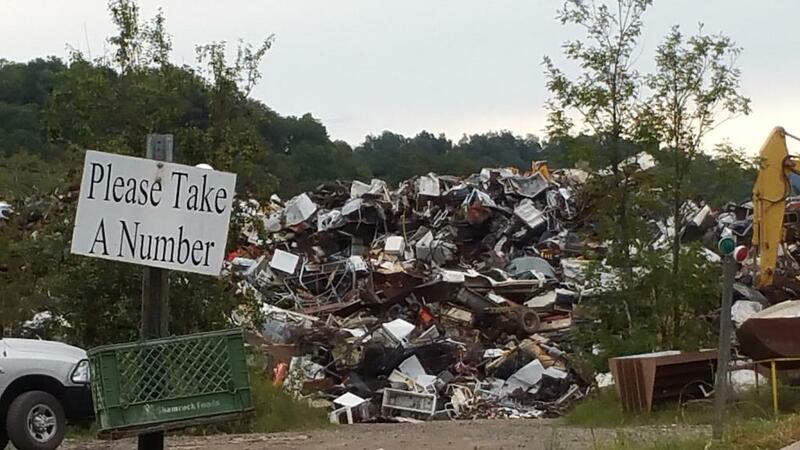 Retailers can't afford to pay reuse price for scrap... no matter what the continent. As a result, African retailers wind up with stuff "traded in" or abandoned or not picked up after repair. Sometimes they made a mistake in importing a device... They order 3,000 large 27" CRT televisions, but can only sell 2,000 at the price they predicted.Number 5 was reported as the largest "illegal" percentage by the Ghana customs agents we interviewed, which are included in the 1/3 of randomly intercepted containers Interpol reported contained some illegal goods. The "elective upgrade" also impacts #4. Consumer demand changes, and sometimes Africa's Tech Sector imports too many Pentium 3s, or non-smart-phones, or older displays. That's the same as Western retailers who must discount stock and sell surplus. It's not "wastecrime". The retailer has already been punished by purchasing something, transporting it, and having to mark it down. This 11 minute video of the exchange between 3 experts in e-waste of Agbogbloshie seems to get into the weeds at some points, but has everything you really need to know on the subject. Wait for the end, when Ph.D student Grace Akese of Memorial University responds to the German photographer Kevin McElvaney's description of the "mysterious" free market fraud which (he alleges) dumps hundreds of thousands of tons (or millions, perhaps) of obsolete non-working electronic waste on the poor of Africa. DK Osseo-Asare (an American who has lived in Ghana for 11 years) responds to McElvaney first, explaining that his allegation they goods don't work and aren't repaired is a bit ignorant. The used products are more likely to work than brand new product sold in Africa. Then Grace Akese of Kumasi, Ghana, who has researched the flow of goods throughout their 20 year lifecycle, has a chance to answer the question. Her command of every study and fact about "e-waste" export to Ghana emerges patiently and slowly. Then she schools McElvaney in a "drop-the-mic" conclusion. 91 percent of the used electronics Africa imports are reused for years. Asset tags add value in Africa's secondary market. An African consumer would no more scrape one off than you'd remove Jennifer Lopez's nametag from a shirt at the thrift shop, or scrape off a brand logo.